For other uses, see Playback. South Asian movies produced in the Indian subcontinent are particularly known for using this technique. A majority of Indian movies as well as Pakistani movies typically include six or seven songs. After Alam Ara (1931), the first Indian talkie film, for many years singers made dual recordings for a film, one during the shoot, and later in the recording studio, until 1952 or 1953. Popular playback singers in India enjoy the same status as popular actors, and music directors, and they also receive wide public admiration. Most of the playback singers are initially trained in classical music, but they later often expand their range. Mohammed Rafi and Ahmed Rushdi are regarded as two of the most influential playback singers in South Asia. The sisters Lata Mangeshkar and Asha Bhosle, who have mainly worked in Hindi films, are often referred to as two of the best-known and prolific playback singers in India. In 2011, Guinness officially acknowledged Bhosle as the most recorded artist in music history. Notable Hollywood performances include Marni Nixon in West Side Story for Natalie Wood's portrayal of Maria, in The King and I for Deborah Kerr's Anna Leonowens, and for Audrey Hepburn's Eliza in My Fair Lady; Bill Lee singing for John Kerr's Lieutenant Cable in South Pacific and for Christopher Plummer's Captain von Trapp in The Sound of Music, Lindsay Ridgeway for Ashley Peldon's character as Darla Dimple in the animated film Cats Don't Dance, Claudia Brücken providing the singing voice for Erika Heynatz's character as Elsa Lichtmann in L.A. Noire, and Betty Noyes singing for Debbie Reynolds in Singin' in the Rain, a movie in which playback singing is a major plot point. Dubbing, also known as looping or post-sync. ^ "Lata Mangeshkar". Times of India. ^ Wolk, Douglas (April 1999). "Kill Your Radio: Music On The 'Net". CMJ New Music (Electro Media): 61. ^ D. Booth, Gregory (2008). Behind the curtain: making music in Mumbai's film studios. OUP USA. pp. 275–276. ISBN 0-19-532764-0. ^ Srinivasan, Meera (27 February 2009). "Fans spend a sleepless night". The Hindu. Retrieved 18 August 2009. ^ Rajamani, Radhika (17 February 2003). "Realising a dream". The Hindu. Retrieved 22 July 2009. ^ "Rushdi remembered as magician of voice". The Nation. Retrieved 8 March 2019. Harris, Craig. "Mohammed Rafi". www.allmusic.com. Retrieved 28 August 2018. "Articles about Mohammad Rafi". Times of India. Retrieved 15 April 2013. 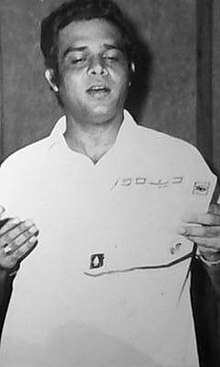 "Ahmed Rushdi, Remembering a legend". Dawn News. Retrieved 28 December 2012. "Remembering Ahmed Rushdi". The Express Tribune. Archived from the original on 27 April 2010. Retrieved 28 December 2012. Gulzar; Nihalani, Govind; Chatterji, Saibal (2003). Encyclopaedia of Hindi Cinema. Popular Prakashan. pp. 72–73. ISBN 81-7991-066-0. Arnold, Alison (2000). The Garland Encyclopedia of World Music. Taylor & Francis. pp. 420–421. ISBN 0-8240-4946-2. Yasmeen, Afshan (21 September 2004). "Music show to celebrate birthday of melody queen". The Hindu. Retrieved 19 August 2009. Pride, Dominic (August 1996). "The Latest Music News From Around The Planet". Billboard: 51. Puri, Amit (24 February 2003). "Dedicated to Queen of Melody". The Tribune, Chandigarh. Retrieved 18 August 2009. "Melody Queen Lata rings in 75th birthday quietly". The Tribune. Chandigarh. 29 September 2004. Retrieved 18 August 2009. ^ "The Sound of Music full credits". IMDb. Retrieved 15 April 2013. ^ Earl J. Hess and Pratibha A. Dabholkar, Singin' in the Rain: The Making of an American Masterpiece (Lawrence, Kansas: University Press of Kansas, 2009), p145. Look up playback singer in Wiktionary, the free dictionary.